A journey through the Land of the Rising Sun should be on every traveler’s bucket list. These design-forward boutique hotels will have you staying in style without going over budget. 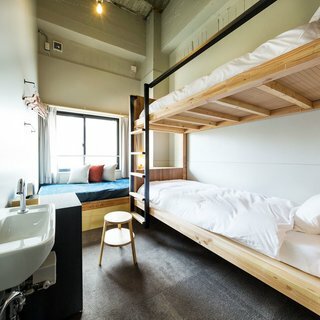 Whether you intend to stay in a bustling epicenter like Tokyo or prefer the quiet solitude of the countryside, these affordable options are perfect for the design-obsessed traveller. Located in the 1,200-year-old historic center of Kyoto, and surrounded by green hills, Nichinichi Townhouse is a holiday home that combines traditional Japanese environments with modern aesthetics. The townhouse sits adjacent to the Nichinichi Art Gallery, a showcase of fine crafts and Japanese culture managed by Elmar, the gallery's owner. 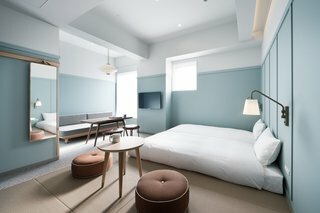 It is the ideal holiday home for travelers who want to immerse themselves in the local customs and unique elegance of Kyoto. 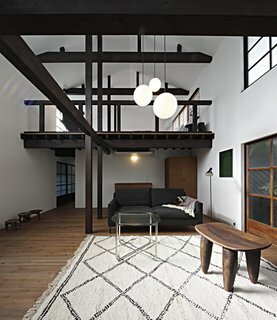 Fukuoka–based firm CASE-REAL executed a renovation of the century-old residence in 2015, creating functional zones that would serve their clients' lifestyles and accommodate guests: a tea room, gallery space, office, and guest room. Surrounded by greenery and looking down at the city of Fukuoka, this boutique hotel enjoys the comforts of a ryokan experience in an urban setting. 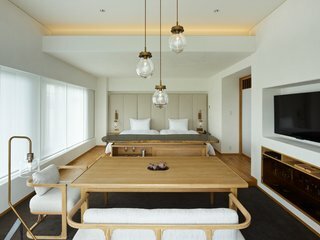 Agora Fukuoka Hilltop Hotel & Spa's 48 rooms explore a range of styles, from contemporary Western to Japanese modernist to tatami-style traditional. Soak in the nearby hot spring or dine in the on-site restaurant, which features a multi-course kaiseki menu. Each of the "rooms" in Shiki Juraku is a self-contained two-level house, featuring a bedroom on the top floor and a traditional or Western-style living room on the ground floor. 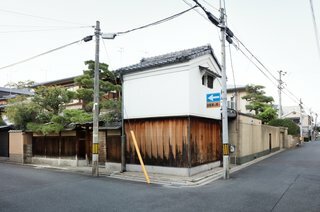 The 10 machiya houses comprise a little neighborhood that feels both contemporary and reverential. Foodies rejoice: Osaka is one of the world's great food cities, and Moxy offers the perfect home base for culinary exploration. The ambiance of this Marriott-owned hotel is youthful and animated—pull up a chair in the colorful common spaces or retreat back to their cozy, eccentrically decorated rooms. If you guess that the Share Hotels Hatchi is just another crowded hostel, you'd be sorely mistaken. 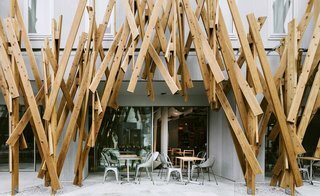 The futuristic yet inviting space sits in Kanazawa, the elegant capital city of Ishikawa Prefecture, for one. The communal area is filled not with rowdy guests but with a charming cafe, a wood-paneled bar, and travelers drinking in the industrial-chic design of the space. Guest rooms—shared or private—are small but cleverly designed to optimize the limited space, so you can save money without losing your sanity. 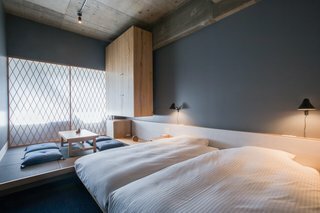 A spinoff of the popular local Wired Café, this boutique hotel brings a much-needed infusion of youthful energy to the Tokyo hotel scene. Wired was designed and branded in part by OMGFCO, who used local vendors, artisans, and craftspeople to source the furnishings and decor—much of which is for sale, in case you’re interested in taking part of your stay home with you. This contemporary hotel seamlessly integrates the look and feel of modern luxury hospitality with the tranquility and ease of ryokan life. 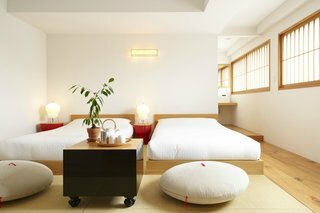 The high-ceilinged lobby and stylish rooms are quietly impressive, mixing tatami traditional, modern furnishings, and urban amenities. The restaurant mimics a ryokan-style kaiseki and is housed in its own separate classically styled building. Contemporary industrial design meets Japanese hospitality tradition at this petite locale. The rooms can fit families or larger parties in multiple configurations, and are designed with a futuristic, minimalist vision. 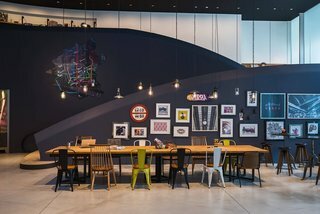 The interior spaces are stylish, organic, and impressive—design-forward but welcoming. A tea salon provides a central social space, and the rooftop deck provides a bit of open-air relaxation. Designed by master architect Kengo Kuma, ONE@Tokyo sits at the foot of the enormous Tokyo Skytree broadcast tower. Kuma designed everything, down to the uniforms worn by the staff, and the result is a hotel that’s like nothing else. The 10-story concrete structure—the ground floor is enveloped in crisscrossing wood beams—features four types of rooms, from compact studios to atelier suites. Visitors can lounge around the lobby café or venture to the rooftop terrace for an unforgettable view of the city's lights. If historical walking tours are your scene, this chic spot is a few minutes’ walk from both Imperial Palace and Nijo Castle. The interiors are modern and airy, interpreting traditional natural materials through a contemporary lens. The common rooms include a library lounge and a shared kitchen to show off your culinary aptitude—unless you prefer the on-site restaurant, Tsunagu. This twelve-room hotel is hard to book—and for good reason. The interior design is by the English design firm Tomato, and the lobby lounge is home to a rotating crew of hip Japanese designers. 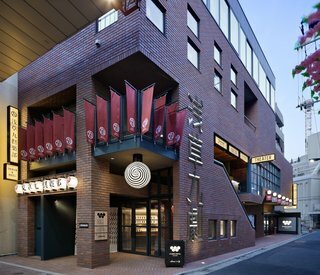 Vestiges of the original New Meguro Hotel remain, adding a sense of authenticity to the interiors. The starting rates are low—around $120 for the most basic single room—though if you wish, you can easily upgrade to a pricier, more expansive option.